The Scarboro Missions Golden Rule poster is making a global impact. Here at Scarboro Missions, we are constantly receiving e-mails and letters about the poster. And they are coming from all over the globe. We also receive newspaper articles about the poster from various parts of the world. Here are some recent samples of these e-mails, letters and articles. Excerpted from, the Scarboro Missions Newsletter of July/August 2004. The following article was published in the Summer 2004 issue of the newsletter of the North American Interfaith Network (NAIN). The article reports on the stunning way in which the poster is being used at the largest tourist attraction in the United States of America. It was written by Rev. John Chell, President of the Mall Area Religious Council. The Mall of America in Bloomington, Minneapolis has become the number one tourist attraction in the USA, with 41 million shoppers and visitors from around the world. The Mall Area Religious Council (MARC) – with NAIN membership and consisting of 36 local Twin Cities congregations and world religion groups – uses the Golden Rule Poster as one way to effectively bring a spiritual presence to the Mall. 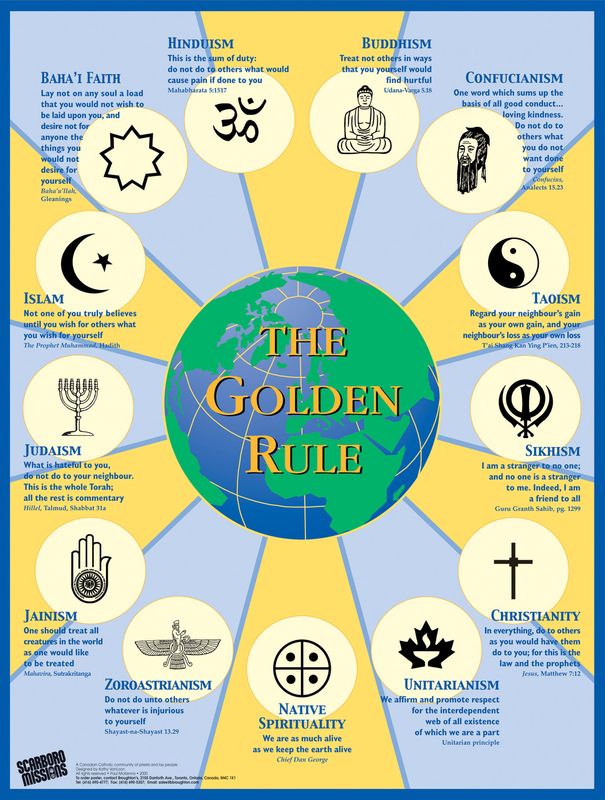 The poster produced by Paul McKenna and Scarboro Missions, (Canada) presents 13 sacred versions of the Golden Rule along with symbols of each religion. MARC uses the poster in very unique Mall Interfaith events which create considerable attention, conversation and mutual understanding. Example One: in a development resulting from the 9/11 tragedy, Mall Management contacted MARC to work with them in the development of an interfaith Employee Meditation Room. At the Opening Ceremony in 2002, MARC presented a matted, framed copy of the poster to Mall Management. It is now the focal point in the “chapel” readily telling folks of all religions that this “sacred space” at Mall of America is for use by all faith traditions. Mall press releases on the Meditation Room have prompted inquiries to MARC from throughout the world, on how to secure copies. Example Two: an interfaith event known as Eleven days for Understanding held at Mall of America, included diverse faith groups: the Immortal Chaplains Foundation, the Guto Wheel of Dharma Monastery, the Mendota Dakota community, the Minnesota Council of Churches and the Mall Area Religious Council. It presented an extraordinary series of exhibits and performances for 11 days from any traditions – calling for peace and compassion. MARC’s interfaith volunteers created a Golden Rule Poster exhibit located in the large Macy’s Court as a place for interfaith conversation. Thousands of visitors were drawn to this Exhibit and considered the increasing need to understand and respect our neighbours’ religion and diversity. Many purchased the poster for use in offices, homes, schools and congregations. Example Three: the MARC Golden Rule poster exhibit has expanded and is now used frequently at the Interfaith Holy Days of Thanksgiving Around the World. MARC expositions are held at prominent Mall of America locations. These days of dialogue with shoppers, visitors and employees heighten the awareness and understanding of the significant Holy Days of our many world religions. MARC Volunteers from many Faiths become a “living exhibit” for neighbourly compassion and respect among all peoples and religions. Example Four: MARC has a signboard at the Mall with placards available for each member group directing visitors to local Places of Worship. It has just expanded to the Mall’s four guest service centres, including sample copies of the Golden Rule poster. The Golden Rule poster and MARC volunteers are eloquent “interfaith voices” in America’s largest Mall. Excerpted from the Scarboro Missions Newsletter of November/December 2004. The Scarboro Missions golden rule poster continues to make its way around the planet. And wherever it goes, it performs its magical task of healing, unity and reconciliation. Africa is one place where it is making a splash. Scarboro missioners in Malawi have presented the poster to the bishop of Mzuzu. Beverly and Ray Vantomne have given a copy of the poster to a priest who is also a professor in Muslim studies in Malawi. Using the texts and symbols of the poster, a mission society in Tanzania has created their own poster in English and Swahili. In Nigeria, Fr. Martin (St. Paul’s Missionary Society of Africa), who has stayed here at Scarboro in recent years, uses the poster in his retreats for priests and seminarians. Many greetings of peace from Ethiopia. It was good to meet you at the Parliament of World Religions in Barcelona. 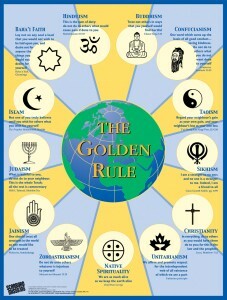 The golden rule poster is the backbone of our interfaith work here in Ethiopia. It is the main tool we are using in our work. Whenever we have seminars, meetings, or workshops, we use the poster to start and end our meetings. I am happy to inform you that I have translated the poster’s 13 golden rules into the local language here which is Amharic. This way, many people can understand the message of the poster. If I get the funds in the future, I am planning to print the poster in our language and distribute it through all the country. From my experience, I strongly recommend the golden rule as a necessary tool for any interfaith group. The golden rule is the key to so much and we are very grateful to Scarboro Missions for producing this very useful poster. Without the poster, I really don’t know how I would have promoted interfaith in a country where even the word “interfaith” itself is new. The Scarboro Missions Golden Rule poster is now on permanent display at the United Nations headquarters in New York City. 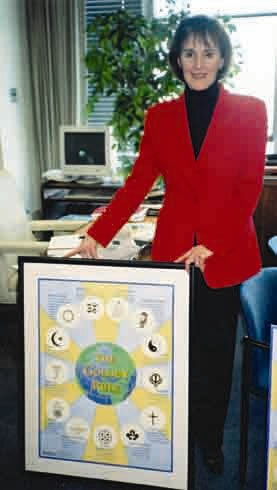 On January 4, 2004, Mrs. Gillian Sorensen (pictured here), Assistant Secretary-General of the UN, accepted the poster as a gift from the North American Interfaith Network. The presentation was part of an interfaith ceremony in which it was pointed out that the Golden Rule is not just a moral ideal for relationships between people, but also for relationships among nations, cultures and religions. In presenting the poster to the Assistant Secretary-General, a statement was read by a representative of the North American Interfaith Network (NAIN). Read the full statement. The Scarboro Missions Golden Rule poster is making its way around the world. What began as an obscure idea in the basement of Scarboro Missions’ headquarters is now emerging as a ‘coat of arms’ for the international interfaith movement. This striking and beautiful four-colour poster features a written and symbolic depiction of the Golden Rule in 13 religions. Scarboro Missions has been overwhelmed by both the success and the universal appeal of the poster. Most striking is the diversity of audiences that are purchasing this piece of multifaith art. This audience includes penitentiaries, airports, seniors’ homes, corporate offices, hospitals, schools, religious institutions, universities, social justice groups, stores, Sunday schools and private homes. In the weeks following the September 11 tragedy, multifaith prayer services took place all over North America. Organizers of many of these prayer services used the Golden Rule poster in a number of ways in their efforts to promote forgiveness and healing. In the coming years, Scarboro Missions will join with people all over the world in translating the poster into several languages. Indeed, we have every reason to believe that this piece of theological art will continue to work its wonders in terms of interreligious healing, unity and reconciliation. Because the United Nations is a home for our highest human ideals, and because the world’s religions have a duty to articulate and promote those ideals, we are honoured to present you with “The Golden Rule.” In this poster, thirteen religious and spiritual traditions state a universal principle in elegant and distinctive forms. These Golden Rules are evidence of a Global Ethic that transcends nations, civilizations, and religions. Yet no other statements so clearly summarize the simple practices of kindness and sustainable human conduct. In recent years, gatherings of religious and spiritual leaders have confirmed that “this ancient precept is found and has persisted in many religious and ethical traditions of humankind for thousands of years. . . [and] should be the irrevocable, unconditional norm for all areas of life, for families and communities, for races, nations, and religions” (Toward a Global Ethic). The United Nations provides a unique forum where the subtleties of this universal principle can be translated into the realm of international affairs. We are inspired by key United Nations documents such as the Universal Declaration of Human Rights and its premise that those rights we wish for ourselves shall be granted to others as well. Equally challenging is the principle that no nation will find peace until it wants for others the same peace and security it seeks for itself. We believe that these Golden Rules, also known as the “law of reciprocity,” must be obeyed by all nations, and that, in the interests of global security, no nations or leaders may exempt themselves. Whatever is hateful or injurious to ourselves, we must not do to others. Failure to adhere to these moral principles brings great hazards to all, ranging from unsustainable development practices to environmental crises and nuclear threats with their inherent potential for catastrophe. Nations must treat other nations as they wish to be treated. Together, these precepts remind us that our diversity can flourish within a greater and simpler unity – the human family, with its common origins, needs, and aspirations. The Golden Rules teach that no one – no nation, culture, or religion – is an island unto itself. Drawing on time-tested wisdom and experience, they presume our interdependence and declare our personal responsibility for the common good. 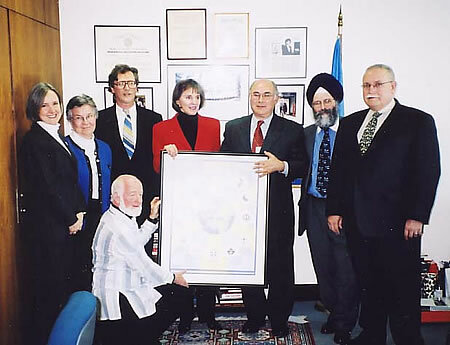 Presenting a framed Golden Rule Poster to the Secretariat of the United Nations on January 4, 2002 were leaders from the North American Interfaith Network (NAIN) and some of its member organizations and friends: Rev. Deborah Moldow from United Religions Initiative at the UN and World Peace Prayer Society; Sister Joan Kirby, Representative to the UN from Temple of Understanding; Father Terrence Gallagher, from Scarboro Missions in Toronto; Joel Beversluis, Editor of the NAIN newsletter and CoNexus Multifaith Media; Mrs. Gillian Sorensen, Assistant Secretary-General of the United Nations for External Affairs; Jonathan Granoff, from Temple of Understanding, Bawa Muhaiyadeen Fellowship, and Global Security Institute; Ralph Singh, Secretary of the NAIN Board, from Gobind Sadan-USA; and Dr. Elias Mallon, a founder of NAIN and Dean of Auburn Seminary.